The Magic Flute gives more visual inspiration than most operas. There are, after all, magic bells and a magic flute, three child spirits, the trials of fire and water, a dragon to slay, a vengeful queen with a high F note, two comedic characters who sport feathers, an old woman who turns into a young woman, a chariot drawn by lions, and villains who dance. In The Magic Flute boy meets girl, boy loses girl, boy finds girl again. Two couples travel through these “always work” scenarios. Both sexes have to suffer ordeals to find each other. Here, true love is the equivalent of truth. Mozart believed in the Masonic rituals of testing as a path to truth and wisdom. In a sense, The Magic Flute is a coming of age tale. The opera has a second story line: the loss of power as the Queen of the Night struggles with giving up her dark realm to Sarastro’s sunlit kingdom. Here, sunlight becomes the symbol of truth. In this battle of the sexes, the duels are for ideas and passions. The libretto makes the evil characters more sympathetic for their sadness. The Queen of the Night loses not only her power but also her daughter. Monostatos can never find love, perhaps simply because he is the other, the dark skinned moor. Then, the comedy of Papageno relieves the entire plot. All of this is encased in glorious music. The Magic Flute project is dedicated to my uncle Edward Ormond (1920 - 2012) who was Assistant Principal Violist in the Cleveland Orchestra for 38 years and spent 51 years totally in American orchestras. Eddie brought his love for music to his family, friends, students, and audiences. In 2005 I used images of war as potent narrative elements. I was haunted by the visuals of Iraq. In a poetic fiction I combined the wolves I’ve painted for several years with Apache helicopters. As I painted my reaction to the war, I found that my symbolic metaphor was indeed a reality. I learned that in Alaska helicopters are used in aerial gunning of wolves. Though the helicopters are not the expensive Apaches, the image is close enough to conflate war and ruthless extermination of animals. After working with wolves as a primary image for several years, I returned to the human figure. I am always looking for a big subject and I found it in age and aging. In a large painting (see the painting page), I combine the landscape, animals, and figures. 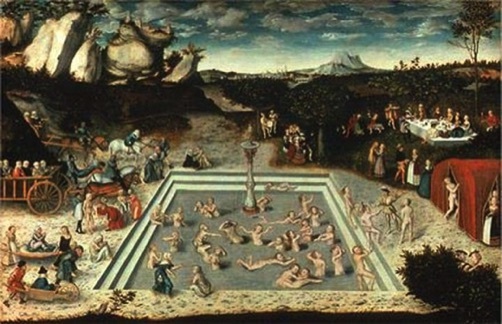 The inspiration is this Lucas Cranach "Fountain of Youth" in Berlin. I look at the past and try to understand what the questions and challenges were. I see if those are relevant now. Then I answer them in my way -- a contemporary way. I may pay homage, but I do not imitate or appropriate. For my "Fountain of Youth", I used models, young and old, of both sexes. Cranach has the men carrying only old women to the Fountain. In Cranach’s world the men need no improvement, but old women are useless. In my painting both sexes take the plunge. In addition, I’ve painted smaller work of fountains and figures -- studies and finished paintings -- and some are on the site. In all, I always try to make a memorable image.